this is my sleepy sunday night post...i've just spent the past two days agonizing over a beautiful 2-bedroom apartment i looked at in not such a great neighborhood. i had already decorated henry's room in my mind. we ultimately decided the neighborhood wasn't right for us at the moment. this lovely mobile by the designer clara von zweigberk would have looked so beautiful in that almost mine nursery! 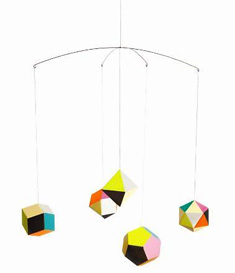 the themis mobile is made of five beautifully colored paper ornaments and will be available this spring at the moma store. happy monday! Good Morning... and I think you should still get that mobile... whereever you will be moving, it will be great! And good luck with the apartment hunting! i need to get this for my other baby! Peggy, thanks! and you are right I should get it!! !